Big news from the Region of Waterloo International Airport today... Starting June 14, 2012, American Eagle Airlines will be offering 2 flights daily from Waterloo Airport (CYKF) to Chicago O'Hare International Airport (KORD)! There will be a total of 13 flights per week for the entire year, with flights leaving CYKF at 6:30am and 4:40pm, and arriving at CYKF from Chicago at 3:55pm and 10:15pm. O'Hare is a major international hub providing connecting flights to locations throughout the United States and the rest of the world. 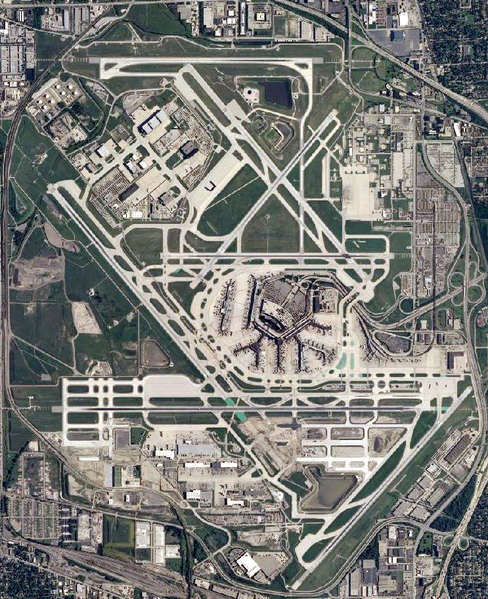 It is currently the third busiest airport in the world, with 66,665,390 passengers passing through the airport in 2010. It is the world's second busiest airport in terms of aircraft movements. The airport is named after Edward O'Hare, the US Navy's first flying ace and Medal of Honor recipient in World War 2. American Eagle Airlines will be operating the 50 seat Embraer ERJ-145 regional jets. The new service is the result of months of discussions between the airline and the local business community. “Daily jet service to Chicago is what our business community asked us for, and we are pleased to be here today announcing just that,” said Chris Wood, Airport General Manager at the Region of Waterloo International Airport. As a general aviation pilot and aspiring professional pilot, I am very excited to see this increase in air traffic, because it will provide me with more experience dealing with wake turbulence and large aircraft. How do you feel about this new service? Please leave some comments below, I'd love to hear from you! For more information, see the media release at Waterloo Airport's website (http://waterlooairport.ca/en/newslist/index.aspx?corpId=gzyzez7QxwumqjwReGz9VgeQuAleQuAl&newsId=UqVsRW71x5lA5HiuhOvsgDj5lA5HvgeQuAleQuAl), or the American Airlines/American Eagle Airlines website (http://www.aa.com/homePage.do).